Another adventure activity ticked off. 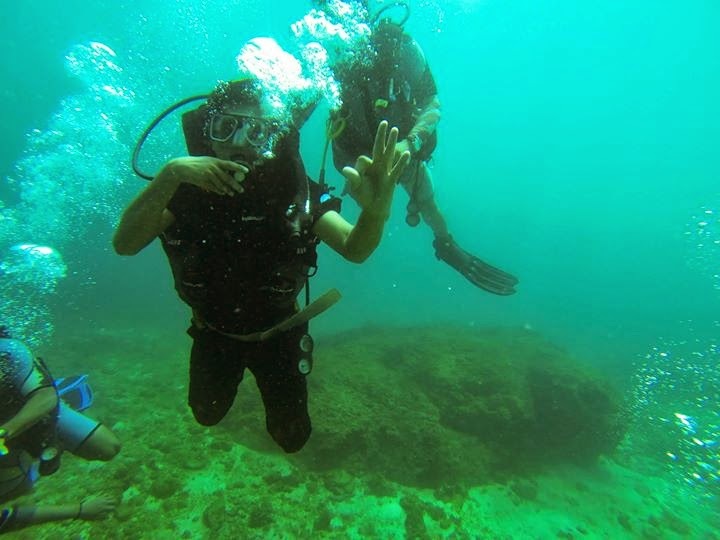 Scuba diving off Murudeshwara was a memorable experience. After seeing BP Bhat’s post on this topic, Scuba diving was on my wishlist for long. Had tried underwater walking in Thailand 2 years ago, which was very close to scuba diving in experience, but there our movements were heavily restricted because of the limited range of oxygen pipe. This time the event was not organized by me- I only arranged transportation (mighty XUV500) while cousin’s friends organized Scuba diving. We’d booked months in advance with DreamzDiving and were eagerly awaiting the D Day (Dive Day). Previous night 10.30PM we left from Bangalore, drove whole night (exactly 500kms) to Murudeshwara via Chennarayapatna, Arasikere, Shimoga, Honnavara-Murudeshwara. I felt this was the best route. We reached Murudeshwara by 6AM, less than 8 hours. I was expecting some practice in swimming pool- which apparently is facilitated by the other Scuba diving organizer in Murudeshwara, but there was none. We were given a jacket and we headed to the boat. Another boat with equipment and support staff left ahead of us. Journey from Murudeshwara coast to Netrani island would last an hour. It is a distance of 22kms. We were told about the key hand symbols underwater. Key point to remember is that ‘Thumbs up’ doesn’t mean I am ok. It means ‘take me up’. We were briefed about the equipment. SCUBA stands for Self Contained Underwater Breathing Apparatus. It is extremely heavy to lift and run, but underwater we won’t feel the load, as it is filled with air and water buoyancy helps it feel light. It has a pressure gauge, 2 mouth pieces (1 for use, one for emergency), buttons to inflate/deflate the air in the jacket. Another important aspect is being able to equalize. As water enters ears, it causes some pain and discomfort. Way out is to try pushing air out of your ears, by closing nose and mouth. We were also briefed on not to touch anything, for we won't know which of them are harmful. Also not to dispose off plastic materials into the sea. Half an hour into the ride, the island was visible to the eye and appeared so near, but it took another half an hour to get closer. The journey lasted for an hour and we finally reached Netrani. Participants from the other organizer had already reached the venue and were practicing. Our boat and support boat was tied together. Few people went for scuba diving first while others were given a face mask and asked to practice in the waters (snorkeling). Water was just about 10 feet deep and we could see scuba divers below us walking close to the sea bed. After about 30 mins of swimming and floating, I went back to the boat and the support staff mounted the oxygen cylinder and other equipment on me. Fins were attached to my legs. As I said earlier, because of heavy tank, diving is done is a particular way- we are pushed backward and before we know what is happening, we'll be in water. One of the instructors took me down, I was very comfortable breathing in and out of the mouth, but took some time to get regular with breathing out of the nose. Whenever I felt discomfort and indicated the same, instructor made me comfortable by taking me little up and giving instructions as to what to do. We dived close to ocean bed and the view was nice. 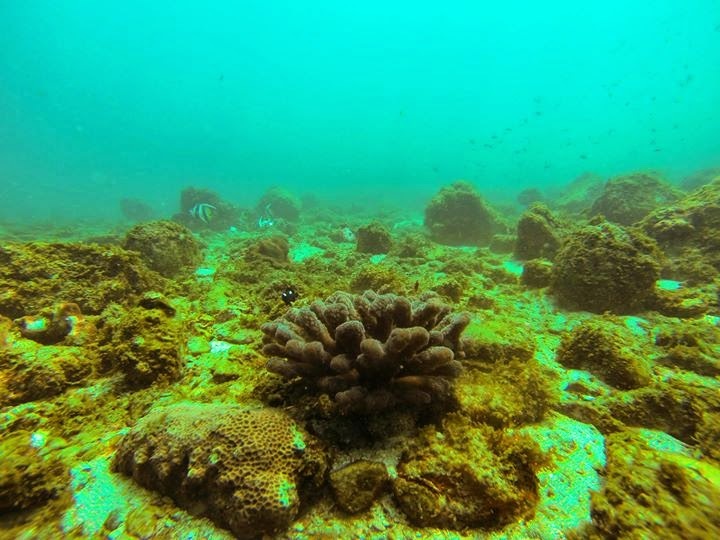 I've not tried the corals at Andaman or Goa, so from what I can remember of my underwater walking in Thailand, Netrani corals and underwater life appeared slightly better. Shande had suggested that we get a contact lens, but I could manage without one. The dive lasted for about half an hour, which appeared so long when under the water. 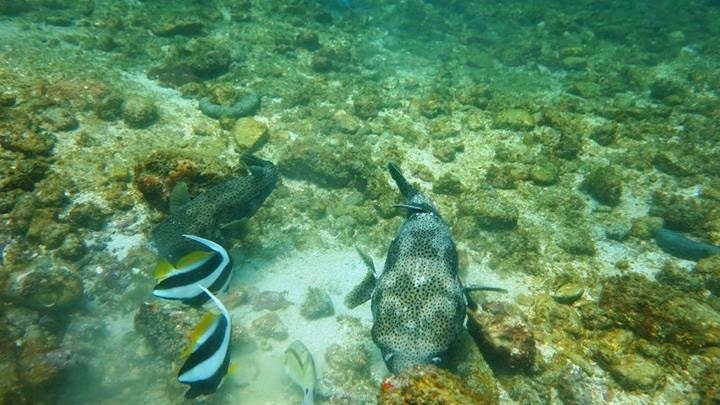 One of the crew took underwater pictures which were eventually shared on their fb page, that's how I got below pictures. Eventually we came up and the memorable scuba dive is over. For those interested, one more dive on same day can be had at an additional 2000 Rs. There was no need for swimming pool training. We managed very well despite being first timers. Swimming & snorkeling in the ocean was fun- thanks to life jacket and availability of trained crew around, the risks were minimized. Waves were largely non existent near the island. Nishant has uploaded a teaser video on youtube about our dive, taken in his gopro. We're all waiting for him to upload full video. So now GoPro is on my wishlist of things to buy. I was expecting a certificate for the dive, but there was none. Next step would be to do a certificate course in Scuba diving. A 3 day PADI certified course enables you to dive solo (provided you've the equipment). Check the entire album on fb here for more photos. बहुत ही रोमांचक अनुभव रहा आपका. उतना ही सुंदर आपका आलेख.please mail me (rksvdesign@gmail.com) deatil about contacts,resistration,fee, rules & regulation and other requirement for this trip. thanks! pretty detailed ! .. thanks for sharing :) and good to know you managed it without lenses ! the Go Pro video is coming out good .. awaiting for the full version ! Rakesh: Will update contact details of the organizers into the post.Pls check that. Such wonderful places in India must be highlighted & publicized. Need to try this sometime, thanks for sharing.. This is awesome. Would love to experience this.